Leicester are moving ever closer to a sensational Premier League triumph after their 2-0 win over Sunderland. Tottenham kept in touch after thumping a poor Manchester United side, while Manchester City have a grip on fourth place after beating West Brom. At the bottom, Newcastle look as if they will go down to the Championship after losing at Southampton, while Swansea shocked Chelsea. 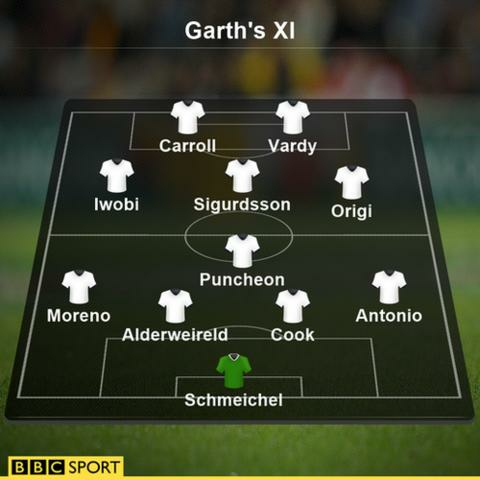 It was last week, in the euphoria after the match against Southampton, that I couldn't help but notice the calm influence goalkeeper Schmeichel was having on his Leicester team-mates. He showed the same maturity against Sunderland after one of the most important clean sheets he will ever keep in his life. Schmeichel knows, of course, the value of clean sheets - his father Peter, one of the greatest goalkeepers of his generation, would have told him so. Schmeichel senior kept 18 of them when Manchester United won Sir Alex Ferguson's first league title in 1993. The qualities needed to win a Premier League title might have also dominated a few conversations between father and son. At least that would explain all the clean sheets recently and the calming influence. Only one father and son - Ian Wright and Shaun Wright-Phillips - have both won Premier League title medals, but I suspect that's about to change very soon. This lad has done a wonderful job for West Ham this season. In recent months, Antonio has gone from an attacking midfield role to a wing-back and done both jobs wonderfully well. Apart from the fact that he can play in any position down the right-hand flank, he has provided manager Slaven Bilic with power and strength in a defensive position, something that they have lacked all season. Like West Ham's other full-back Aaron Cresswell, Antonio has a quality delivery and it was his sensational cross that provided Andy Carroll with his hat-trick goal against Arsenal. Cook's finish against Aston Villa was a lovely goal by the centre-back. In fact, it was the sort of finish you would expect from a seasoned striker rather than an central defender. Bournemouth have passed the 40-point mark, a wonderful achievement in itself, and now they can begin planning for another year in the top flight. This is a remarkable achievement by the Cherries not least because it provides another opportunity for Callum Wilson to establish himself as a Premier League performer after a harrowing cruciate ligament injury. It was Wilson's goals and endeavour in the early part of the season that gave Bournemouth the belief that another year in the Premier League was possible. Three Tottenham goals in six minutes put totally out of the question all thoughts of Manchester United coming away from White Hart Lane with anything more than a handshake. For me, the star of the show, and he has been for a some few weeks now, was Alderweireld. The Belgium international has held the fort brilliantly for Spurs, particularly in the absence of Jan Vertonghen. His quiet demeanour often belies his commanding presence in defence but it was his aerial prowess in attack that cut United to ribbons. Spurs are still in the title race but it is Leicester's to lose. What a strike from the full-back to open Liverpool's account against Stoke. It was Moreno's left-footed strike that flew past goalkeeper Jakob Haugaard. This lad always looks impressive on the ball, particularly in forward positions. Yet only a few days ago, I thought Moreno was extremely fortunate to stay on the pitch against Borussia Dortmund in the Europa League quarter-final when he needlessly lunged into a tackle that could have seen the Spaniard sent off at a crucial stage of the match. The defender is often prone to these frustrations. However, when he's on top of his game, he can be a delight to watch and against Stoke he had one of those matches. Palace's Puncheon hadn't scored all season and, after he missed a glorious chance in the first half against Norwich, you could be forgiven for thinking he wasn't going to break his duck. However, in a rather tense affair between two teams desperately in need of points to ensure their Premier League survival, it was Puncheon who produced the magical finish to give Palace the points. The finish left Puncheon emotional and understandably so. After all, he has had a season disrupted by injury and misfortune. However, I cannot for the life of me understand how referee Michael Oliver never gave Norwich a penalty when Damien Delaney completely flattened Matt Jarvis in the area. I haven't seen anything quite so blatant for years. I was amazed that manager Jurgen Klopp selected Divock Origi ahead of Daniel Sturridge and Roberto Firmino against Borussia Dortmund. However, his plan worked. Not only that: This youngster is looking better by the minute. Against Stoke, he took his goals brilliantly but the confidence he is displaying suggests that Klopp believes this could be the real deal. I had real reservations about Liverpool winning the Europa League with Origi leading the line but I think I am going to have to revise my position. If you're going to score your 11th goal of the season, it might as well be the one that secures your team's Premier League tenure for another year. That was the impact of Sigurdsson's 25th-minute winner for the Swans, against a Chelsea side who, for the first time under Guus Hiddink, looked slightly off the pace. This has been a very difficult season for Swansea, particularly since the sacking of former manager Garry Monk. Nevertheless, they have found a way to survive. Now they must maintain their integrity as they face Leicester and Newcastle in games that will have a profound impact on the title and relegation pictures. The only person who really survived Arsenal's mauling at Upton Park was Iwobi. The youngster set up Mesut Ozil and Alexis Sanchez with two lovely assists that should have put Arsenal into an unassailable lead against the Hammers. Amid all the hullaballoo about Arsenal missing yet another opportunity to wrestle the title from Leicester's grasp, I want to know how the FA could have allowed this prodigious talent, who played for the England Under-19s, to fall into the hands of Nigeria. The Super Eagles have failed, yet again, to qualify for the Africa Cup of Nations and now Roy Hodgson can't even add the this lad to the other exciting prospects for the European Championship. We really can't afford to let talent like this slip through our fingers. He only had two chances in the entire match at Sunderland. When they came his way, Vardy nailed them. If Jack Rodwell or Patrick van Aanholt could have shown the same composure as Leicester's top goalscorer, the Black Cats would have come away with at least a point. What I'm struggling to come to terms with is the way Vardy, in particular, seems totally unfazed by the position in which he and his team-mates find themselves. At no stage against Sunderland did Leicester let the situation get to them. It was only at the final whistle did we see any sign of emotion. Manager Claudio Ranieri fought back the tears as his team took another giant step towards lifting an unprecedented Premier League title. It was a sensational piece of finishing from Vardy. He's certainly having a party. It was his first league start for the Hammers since January but Carroll not only put a massive dent in Arsenal's title challenge, but also left bodies in golden shirts strewn everywhere. The Gunners had this game wrapped up at 2-0 after 35 minutes. That was before the 6ft 2in Carroll began to terrorise the entire Arsenal back four, with Laurent Koscielny and Gabriel the two main casualties, neither of whom relished the physical battle. By the end of the match, both of Arsenal's centre-backs looked as if they'd gone three rounds with Anthony Joshua. The West Ham centre forward absolutely destroyed them. The question now is: Can Arsenal recover?